The inclusion of former Waitakere United striker Gagame Feni was a key component in their success in the championship and he paid back Solomon Warriors’ confidence in him with the goal that sealed the final win. The first goal was scored by Carroll Kakate who sneaked past the Western United defenders to give his side a 1-0 lead in the first half. 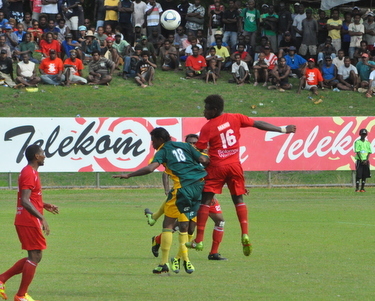 The victory rounds off a magnificent season for the ‘men in red’ who were also nominated to represent Solomon Islands in the next O-League in June by their peer clubs in the Telekom S-League. Earlier this year they beat Western United to the top of league table with a total 34 points from 14 matches compared to their closest rival’s 31. Their double win also represents a major financial windfall for the club who will walk away with a prize purse totalling $300 000 (USD$42 000), $150 000 from the league and $150 000 from the championship. This will support the club’s fundraising activities greatly as they look ahead to the O-League. Former Solomon Islands international, Judd Molea, who played a major role in his club’s success this season was over the moon with their league and championship double. “There are no words to describe and express how happy we are to win both the TSL league and the championship. We have worked so hard to achieve it and our hard work has indeed paid off,” Molea said. “We have proven to ourselves, our families, the fans and the country that anything is possible when you dedicate your heart, mind and soul into something you want to achieve,” said a happy Molea who continues to fight for a place in the national team. The match kicked off to an even tempo under great conditions and neither side looked like it wanted to win in the first 20 minutes. As the first half went on sparks of life ignited the 2 sides and both goalkeepers made close saves to maintain the deadlock. Western United had a good chance to go ahead through Joe Luwi in a one-on-one with Silas Seda but he sent his shot wide. Kakate, however, did not make Luwi’s mistake when he broke past the offside trap in the 40th minute to give his side the lead. It was all about pace and precision as the striker drove home his shot from 18 yards out. Western United returned strongly in the second half but the suspension of 3 players including international goal-scoring hero, Himson Teleda, was apparent with a somewhat dented offensive. Solomon Warriors, however, did not share their opponent’s demise and had a full strength side to call upon. Such a call was made midway through the second half when Feni was brought in from the bench. He made an immediate impact but saw his first drive for goal result in a booking instead of a penalty kick after the referee ruled that he dived. Once more Feni went close but the third time he was in a better position and he placed his short perfectly to cement the win. Western United did not match the Solomon Warriors firepower in the final but will look back at the season as a successful one for them. They finished in second place in the league and also in the championship and that guarantees them a $165 000 boost in their bank account. Another remarkable story from the season is Real Kakamora’s amazing turnaround. Last season they finished in bottom place but they have accomplished a stunner to finish in third place in the championship for a $70 000 take home prize.